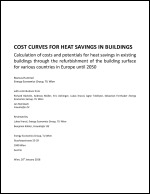 This report shows the underlying data on existing buildings, the assumptions regarding future developments of the building stocks, the costs and energetic effects of various renovation measures on different parts of the building shell, the methodology for calculating the cost curves for heat savings in buildings, the resulting cost curves for the countries under investigation including their sensitivity to important input assumptions, and conclusions as well as discussion points that resulted from this work. 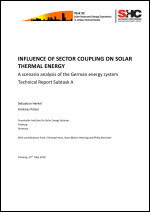 This report presents the results of a scenario study on the potential role of solar thermal in future energy systems in Germany. This work is applied in the IEA task 52 Solar Heat and Energy Economics in Urban Environments. In the framework of IEA-SHC Task 52 the (possible future) role of solar thermal energy utilization in urban environments is investigated more deeply. 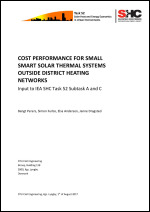 Main focus is on the utilization of solar energy by means of active technologies such as solar thermal collectors.This report presents the scenario results calculated based on the methodology in Subtask A of the IEA task 52 Solar Heat and Energy Economics in Urban Environments. 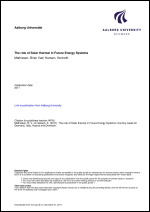 This report deals with solar thermal technologies and investigates possible roles for solar thermal in future energy systems for four national energy systems; Germany, Austria, Italy and Denmark. The project period started in January 2014 and finished by October 2017. This report is based on research performed by Aalborg University with the collaboration of Subtask A project partners Sebastian Herkel and Andreas Palzer from Fraunhofer ISE, Marcus Hummel and Richard Büchele from the Technical University of Vienna as well as Bengt Perers and Simon Furbo from the Technical University of Denmark. Additional collaboration with other subtask project partners has contributed to enhancing the methodology and reporting of the research. Contributions from Rasmus Lund from Aalborg University are also appreciated. Other than for solar district heating, solar thermal systems attached to individual buildings face a significant market downturn all over Europe for several years already. On the other hand, every solar thermal technology enables CO2-free heat supply and hence has the potential to contribute to future low-carbon energy systems in cities.